The entire system of voter registration in the state of Ohio is a joke, as are the processes to get on the ballot, start a voter driven initiative and to change the State Constitution. We have local “Board of (S)Elections” that are run by the two political parties for their own edification. We have multiple voter registration databases instead of one, we have different tabulation systems and even different voting machines. Nothing talks to anything smoothly, and there is no standard system. 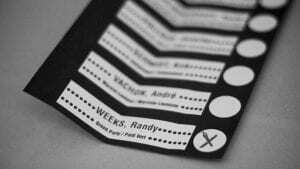 Paper ballots, with standardized design, marked clearly. As if the fiasco in 2000 in Florida with the “Butterfly ballots” wasn’t enough to tell us that we may have some fundamental problems with the way we manage our elections. Compare the last ballot you filled out- to what the standard is for all of Canada. There is no question of who, or what you are voting for. The registration system is also national, not local. The real question is why is removing people from voter rolls so critical? Is it because of voter fraud? We’ve not seen any evidence of that (except Dr. Adil Baguirov and his business partner who were allowed to vote from a place they didn’t live- without consequence or investigation) I once identified something that looked like we had a problem with our voter database in Montgomery county- but no one seemed to care. So now, our method of purging voters has made it all the way to the Supreme Court, which is absolutely fascinating, because, I have proof (I’m saving it for the end) that the purge of voters isn’t about anything but keeping voters away from the polls, limiting elections to the party faithful (the Monarchy of Montgomery County etc.) and nothing else. In a spirited argument on Wednesday (Jan. 10, 2018), the Supreme Court appeared deeply divided over whether Ohio may kick people off the voting rolls if they skip a few elections and fail to respond to a notice from state officials. Justice Sonia Sotomayor said Ohio’s approach effectively disenfranchised minority and homeless voters in the state’s major cities and was part of a broader effort to suppress voting. “All of these impediments result in large numbers of people not voting in certain parts of the state,” she said. But Justices Anthony M. Kennedy and Stephen G. Breyer expressed concern about maintaining the integrity of the state’s list of eligible voters. At the exact time this was going on, I received an automated piece of mail from the Montgomery County Clerk of Courts (the office Russ Joseph was just anointed to) addressed to my dead father (Aug 18,2016) asking him to report for Jury Duty. One would think that when a death certificate is filed with county, that record would clearly be used to purge the voter rolls and the DMV registrations. Looking up my dad at both the state and local level, he’s not in the voter database, so how is he being called for Jury duty? Must be his drivers license, which should have been terminated as well. Of course, when going to vote, a state issued ID is mandated, so wouldn’t it be appropriate to remove that record as well? Being the dutiful son, I went to the website and filled out the questionnaire to request he be excused. He qualified because of his age, but- I made sure to fill in a reason he couldn’t serve “Because I am dead, Aug 18, 2016). Imagine my surprise a week later when I got the form letter to the dead guy- that he was excused from Jury duty. Why thank you Russ Joseph. Maybe it’s time Ohio stopped entrusting the voter rolls and DMV records to incompetents. That may go a long way to stopping the argument about purging voter registrations without involving the Supreme Court.